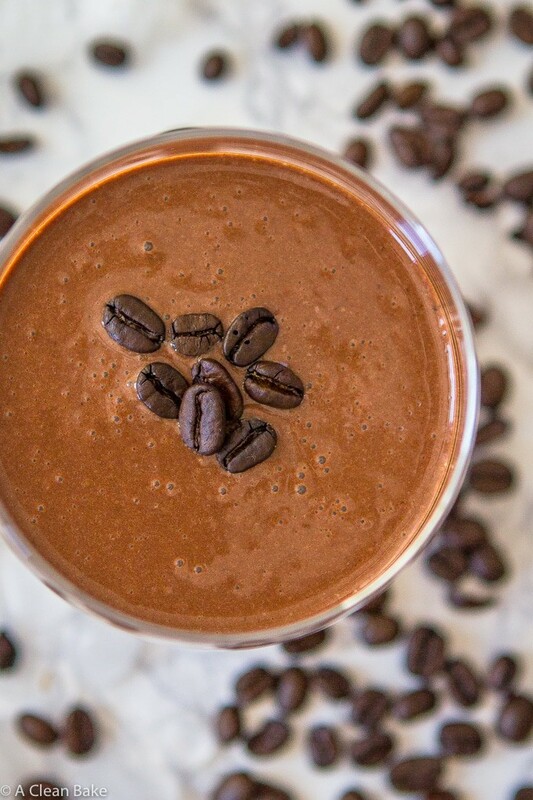 Start the day off with a mocha protein smoothie! 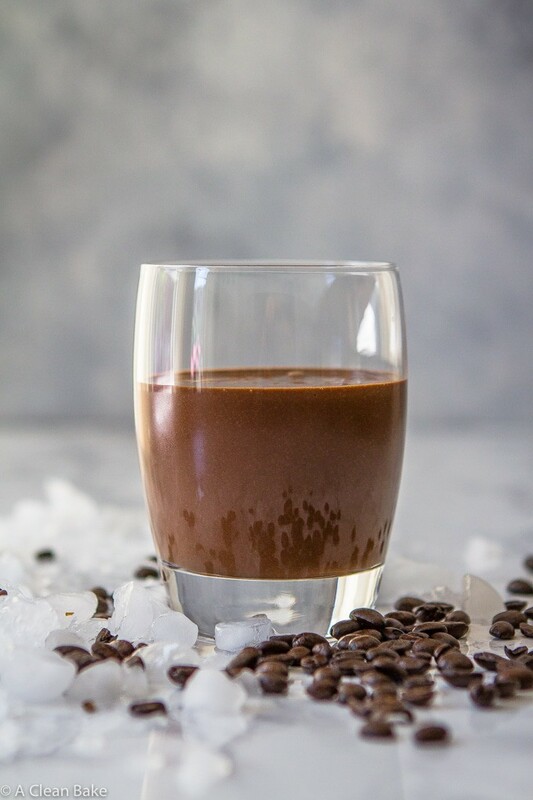 This coffee-laced meal-in-a-glass contains provides your morning jolt, plus healthy carbs, good fats, and 28 grams of protein to sustain you all morning. 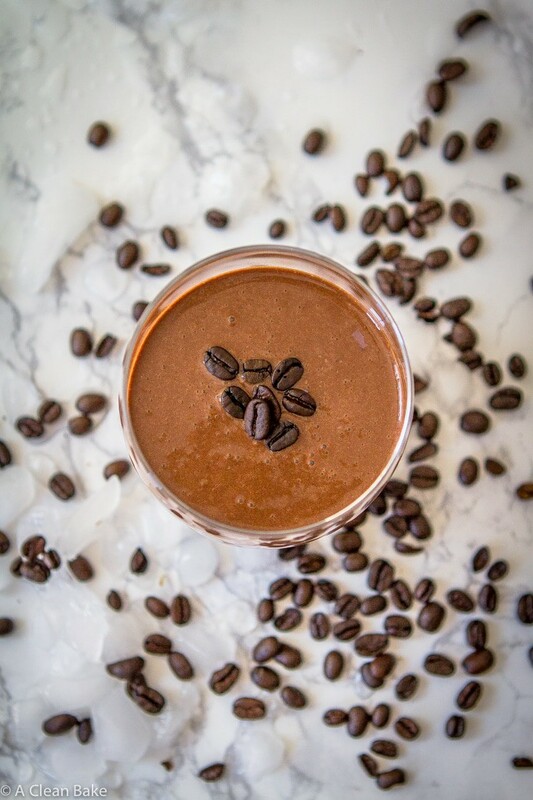 The other day, I turned to my husband and said “you know things are bad when you put a cup of coffee in your smoothie, and then have another cup of coffee with it”. Basically, what good is food if it doesn’t have caffeine in it? It’s not that I try to go to bed at midnight every night. It just happens. By the time we put the baby to bed and sit down to dinner, it’s already 8:30, then you figure you have to breathe for a moment (you did, after all, survive another day), then clean up and get ready for the next day. By the time you collapse into bed, it’s already 11:45. How does that happen???? Then there is the tiny, hungry alarm clock that wakes us up at 6:30 every morning, and typically around 4am, too. Serious question: how do those of you with more than one child, um, survive? I don’t mean that metaphorically. I’m wondering how you are still alive. Caffeine, I’d guess? And a lot of it, most likely. In fact, I’m assuming you have to drink most of your nutrition, because who has the time or dexterity to actually chew your food while attempting to wrangle the feral octopus who has, overnight, taken the place of your infant? This is normal, right? Please tell me this is normal. Yogurt. I used plain, full fat Greek. You can use any dairy free variety, and non-Greek will work fine too. Either way, you’ll get a good dose of protein and some fat (or use a fat-free yogurt, if you want). Tahini. I like the milder flavor it imparts, and it also makes this smoothie nut-free. But feel free to use almond or cashew butter, which also offer some healthy fat, some protein, and a neutral flavor. 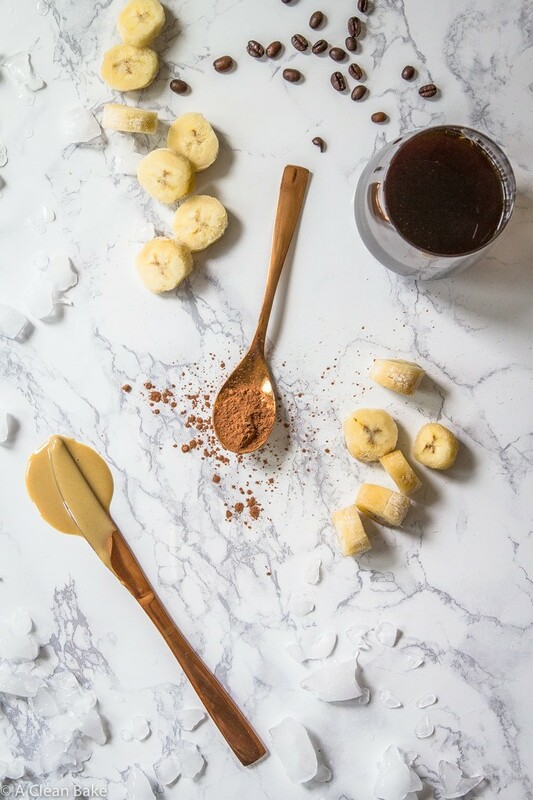 Or use peanut butter, if you want, which has more protein but also will make the shake taste decidedly peanut buttery (not that that’s a bad thing!). Protein powder. This is where the bulk of your protein comes from. I use this (dairy/lactose free) powder, which offers 20g of protein per scoop! 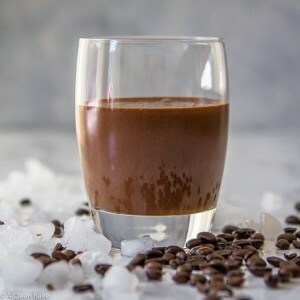 Use whatever you’re comfortable with, and if you want your shake to be extra chocolatey, you can use a chocolate-flavored powder (not that you need it). Cocoa powder. Honestly, there is no nutritional purpose to this, unless you count antioxidants. It just tastes really, really good. I’ve said it before and I’ll say it again: the only cocoa powder I use in my kitchen is NOW Foods brand. It’s just so darn good. 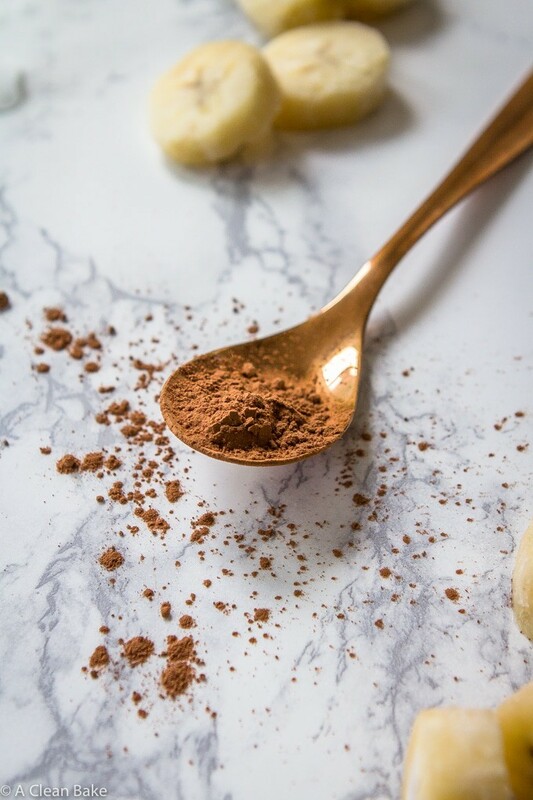 You can use cacao powder, if you prefer. Banana. I like frozen bananas to make the smoothie a little thicker (you can also add ice, if you want). But feel free to use fresh bananas if that’s all you have on hand. Either way, it offers some healthy carbs, fiber and sweetness to balance out the bitterness of the cocoa powder. Vanilla and salt. Both are optional, but bring out the flavor of the cocoa and the sweetness of the banana a little bit. 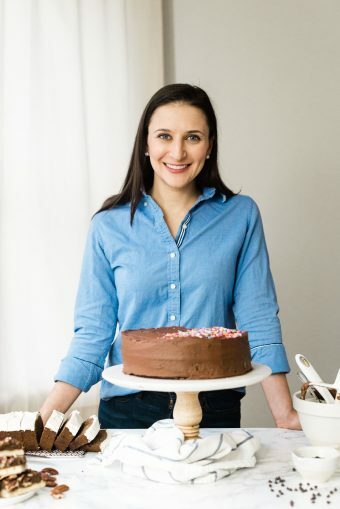 The catch-22 of early parenting seems to be the fact that you need plenty of calories, and healthy ones (especially if you are a nursing mother, but really anyone who has to keep up this insanely sleep-deprived schedule needs consistent energy and level blood sugar), but you have little time to consume them, and even less to prepare. Since you’re blending all of your kid’s food into mush anyway, why not do the same with yours? It’s so much easier to get adequate nutrition that way. Because the alternative, as I’ve admitted before (#noshame), is living off of spoonfuls of nut butter and handfuls of chocolate chips. And even that gets old. Add all ingredients to the jar of a high speed blender and process until smooth. Make this dairy free by omitting the yogurt or replacing it with your favorite non-dairy plain product. Make this egg free and/or vegan by using a plant-based protein powder. Thanks for letting me know, Dena!